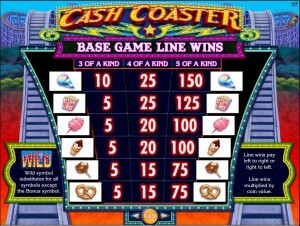 Cash Coaster’s action takes place in an amusement park and it’s inspired by roller coasters. 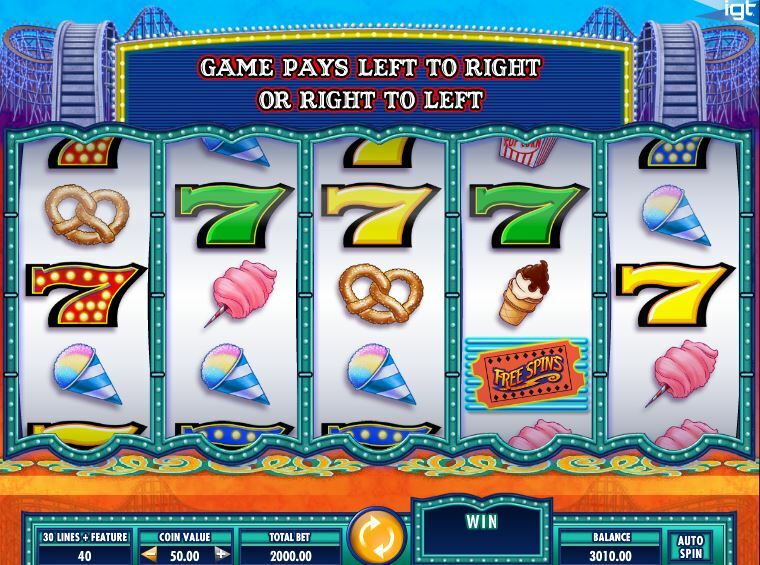 Designed by IGT, it doesn’t look like one of their newer slot machines since the graphics aren’t that impressive, but the features are unusual and at least you’re not going to get bored playing it. Another thing to appreciate about it is the fact that it pays both ways. 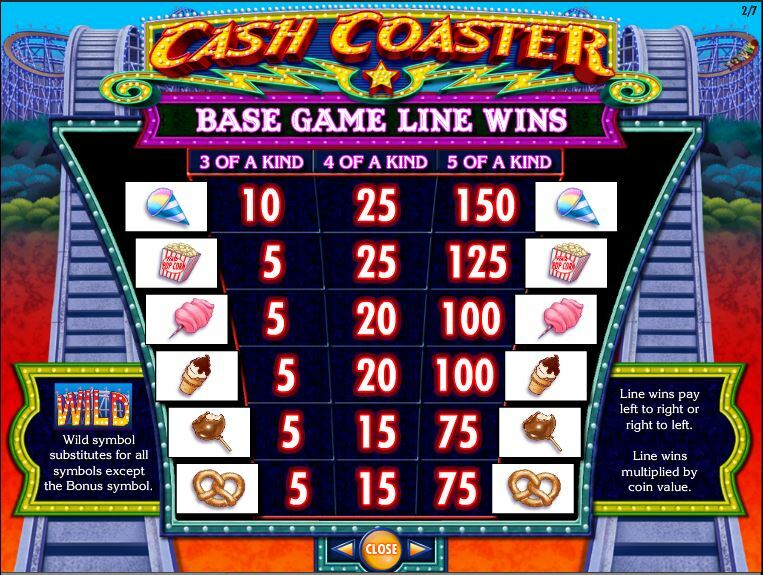 The game is designed to celebrate roller coasters, but it also has a lot of symbols with foods that you get at an amusement park. 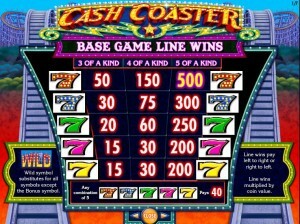 You can win up to $25,000 if you make the right wager and you get the right combo on one of the 30 paylines of the game. 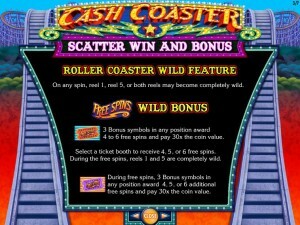 Some very interesting options are present in it, including the Roller Coaster Wild and the Free Spins Wild. A regular wild is present as a very nice bonus. A feature that you get from most games is the wild symbol. Scatters also exist in most slots, but what is unusual here is the Wild Feature which they trigger, combining wild reels with free spins. One thing that I appreciated seeing in this slot is the ability to create combinations with symbols going from left to right and from right to left. The majority of the slots will only give you the first option. The Wild is a simple symbol, used for the purpose of helping you form new combinations, nothing more. If it appears where it needs to, it can substitute for another symbol as long as this brings you a winning combo. It can also appear as a wild reel, but only during the Wild feature. It doesn’t offer its own prizes. 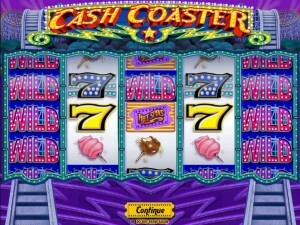 One of the features of this slot brings you wild reels, at random. In every spin, there is a chance that one or two reels will turn entirely wild, enhancing your chances to create a combo considerably. The 1st and the 5th reels are the ones that can become wild, either one or both in the same round. You pay extra for this particular feature, with the equivalent of another 10 lines on top of the initial 30. That’s why 40 coins instead of 30 each round. The Ticket Stub with Free Spins on it is the bonus symbol. Three symbols are needed in any position, and if they appear you get between 4 and 6 free spins and a prize worth 30 coins. 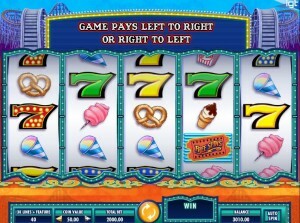 To find out how many free spins, you choose one of the ticket booths and it lets you know what your reward is. The 1st and the 5th reels are both wild for the duration of the free spins, which explains why you don’t get more of them. 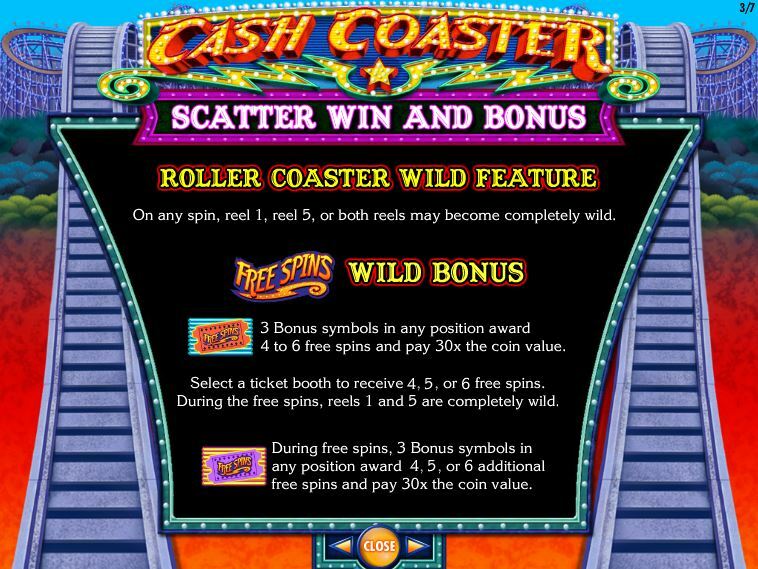 You can retrigger the free spins if you have another three ticket stubs scattered on the reels during the feature. When you place the wager, you will notice in the bottom left corner that you wager on 30 lines and you also use something extra for the special feature that gives you wild reels. A total of 40 coins are used each round, each one worth between $1 and $50. 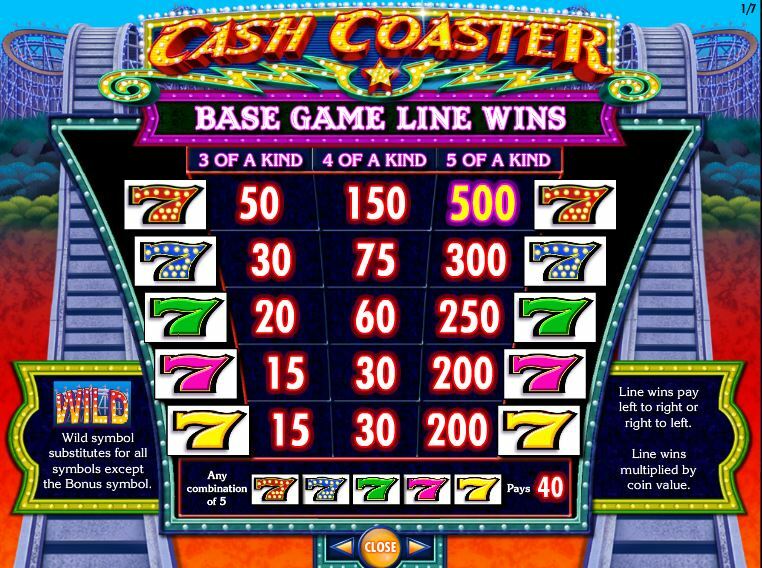 The result is a betting range of $40 to $2,000, so it’s not the kind of game that a penny slot fan will want to try. You will notice on the paytable that the highest multipliers go up to 500x, so you can get up to $25,000 cash. The roller coaster theme is obvious thanks to the dangerous looking rail tracks that are placed behind the reels of this game. They go up and down, and they don’t look inviting at all. There are reels with irregular shaped borders, with symbols being either foods, ticket stubs or 7s with lots of lights on them. Though the choice of symbols is OK for the most part, the design is not as far as I’m concerned. It looks like an older slot machine, and if the graphics matter to you chances are that you’re not going to be satisfied either. Symbols: Red 7 (500 coins), Blue 7 (300 coins), Green 7 (250 coins), Pink 7 (200 coins), Yellow 7 (200 coins), Ice Cream Cone (150 coins), Pop Corn (125 coins), Cotton Candy (100 coins), Chocolate Ice Cream (100 coins), Candy Apple (75 coins) and Bagel (75 coins). The design and the way the roller coaster theme was implemented is far from exciting, but I am a big fan of the features which the game introduces and the way the game plays, relying quite heavily on its wild features. 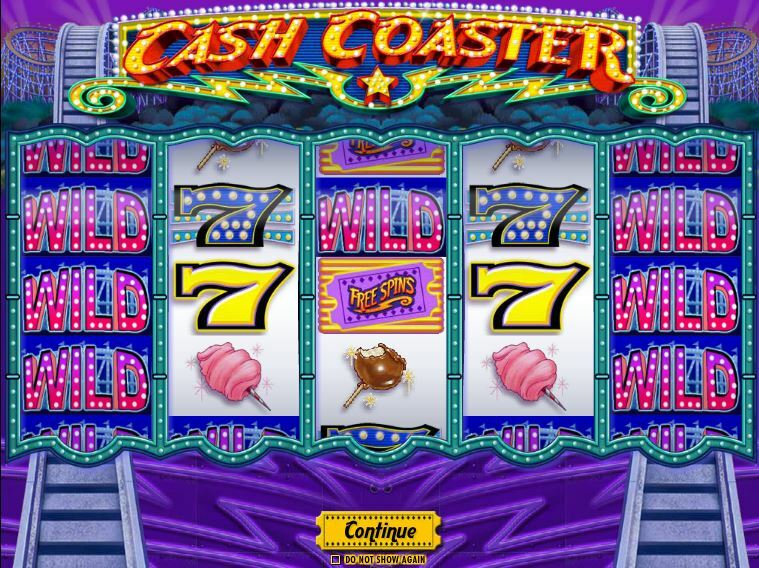 The Cash Coaster slot machine is offered through the IGT platform, so if you want to play it for real or just to practice, look out for casinos that use it.